3D Printing has gripped the entire world and the people from across the globe are contributing to the revolution by research and innovation. Hobbyists, enthusiasts, engineers, and researchers are creatively using their skills to innovate 3D printing technology. In this quest, we have come across some intriguing and interesting 3D printers. We compile a short list of 5 of the most interesting 3D printers. 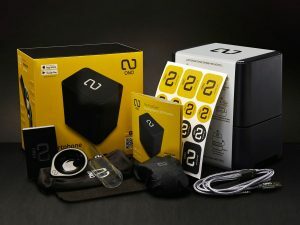 ONO Printer is the World’s First Smartphone 3D Printer. It has some really cool breakthrough features which make this printer one of the most interesting 3D printer in the market. The simple fact that the resin can be cured with the white light of any smartphone is a wonder in itself. This printer works on the same principle as a regular laser sourced 3D printer but in case of a professional printer, which uses a costly light source, Ono uses only the white light of a regular smartphone. With a dimension of 180x128x185 mm and weight of only 780gms, it is not only one of the tiniest but also one of the lightest 3D printer ever. The printer can achieve good Z & X-Y resolutions. It has proprietary materials available in different colours and comes with its own iOS and Android application. Read more on the official website. All things made in nature are built from bottom to top, and with appropriate amount fibre pattern within the structure for perfect strength and durability, 3D printing although tries to replicate the same pattern of building a product from bottom to top but can’t match the nature in terms of the fibre pattern inside the structure. But a new technique named Rotational 3D Printing has brought the same power to 3D printing. Researchers have developed a way to deposit the right amount of fibre in the optimal place with the help of a rotating nozzle to build stronger and stiffer parts than ever before. Dobot (pronounced as Do-Bot) is not a conventional 3D printer but a programmable robotic arm and this makes it an interesting 3D printer. 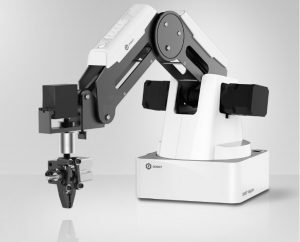 The robotic arm can be attached with 5 different end effectors and one of them being a 3D printer extruder. This extruder fitted arm is capable of printing in a build volume of 150mm3. Dobot received wide recognition at Las Vegas CES 2018 Event. This patent-pending 3D printer offers a new perspective on the 3D printing technology. Blackbelt 3D has tried to define a new Z-axis by moving the Z-axis in a horizontal direction. So, after each layer, the print moves in a horizontal direction. The printing occurs on a conveyor belt and this enables the printer to build extremely long models and un-supported horizontal overhangs. 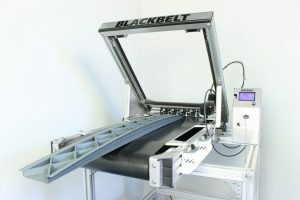 The printer also allows for series production as it prints on a conveyor belt and printing can continue for hours and days without the need to stop and clear out the prints as in the case of other printers constrained by the build volume. Check out the introduction video for the 3D printer. 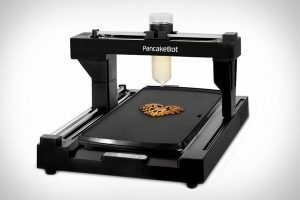 PancakeBot is the world’s first food printer which 3D prints pancakes as easily as printing with any regular FFF printer. The thin dough or batter is loaded into the dispensing unit and the printer prints the pancake directly onto the pan (build platform). The designs for the pancake can be created in the supplied software or can be uploaded via an SD card or can be browsed and downloaded through PancakeBot’s online community. About Manufactur3D Magazine: Manufactur3D is the first online 3D printing magazine in India. We offer 3D printing news in India, analysis and insights from the 3D printing world of India. Check out our 3D Printing Info page for more information on 3D printing.To stay up-to-date about the latest happenings in the 3D printing world, like us on Facebook or follow us on Google+.